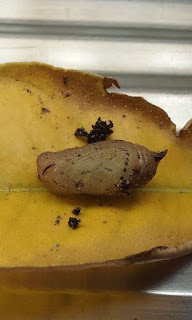 Six weeks ago I found a little chrysalis below my lemon tree, right in the line of the Starling nest in my cubby house roof. 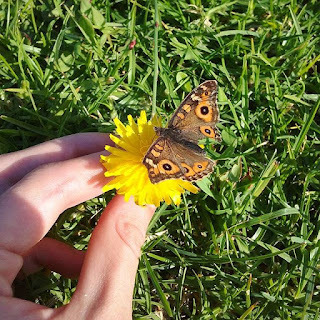 Now when it comes to nature I like to leave well enough alone and not interfere - but knowing the birds would have inevitably munched on him, I had to bring this little guy in and give him a chance at life. So I Googled and Googled until I could Google no more and set up a habitat, and I want to share what happened over the next five weeks with you. 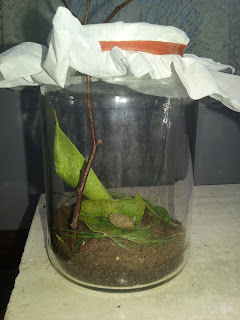 For anyone who finds themselves in a similar situation, the set up I used was a wide mouthed glass mason jar, some moist seed raising mix on the bottom, a few leaves from the host plant (lemon tree), some grass and a stick placed vertically for the butterfly to hang and dry it's wings when it emerged. Then, a simple tissue placed over the top and secured with a rubber band. Daily, I misted it and honestly there was almost no change for such a long time. It wasn't until about two weeks later when I noticed the bottom of the chrysalis getting darker. You might notice by the picture on the left that it kind of looks as though the pattern of the wings are stenciled on the cocoon, and as time went by that stencil became obvious. After about four weeks, I stopped checking the chrysalis daily. A few people in a Butterfly Enthusiast Facebook group informed me that it was dead, and that it should have only taken a week to emerge. I had decided to keep it just in case and exactly five weeks later, I checked on it and it was entirely black. Devastated, I thought I'd left in too much sunlight and burned the little guy. The next day I couldn't believe it. 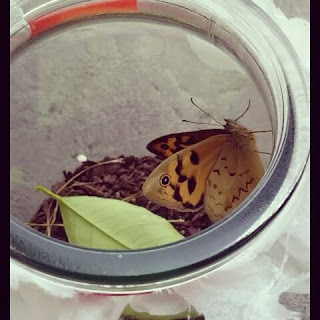 I went in and checked on the jar and there was a beautiful, male Heteronympha Merope butterfly. He was just waiting for the weather to warm up! He's been released now, and watching him fly away was one of the most satisfying moments I've ever experienced. So that's my little story for the week! Have you ever done something like this? Let me know on Twitter or in the comments! 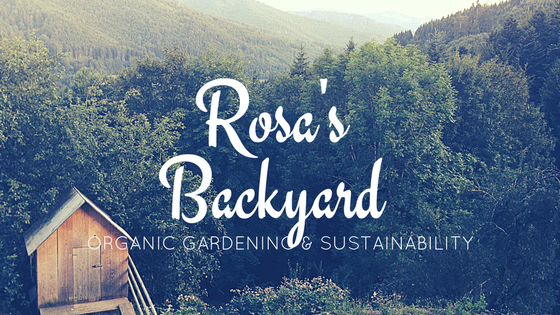 All about organic gardening and sustainability! To sign up for the monthly organic gardening newsletter, click here: Newsletter Sign Up! Top 5 Shade Loving Herbs!